Abbas would lose to Hamas leader Haniyeh if elections were held today. In an insane world, if you’d like to see Palestinians gainfully employed, you are denounced as anti-Palestinian. If you prefer that Palestinians remain impoverished, you can call yourself a champion of the Palestinian cause. An Israeli civilian who thwarted a terror attack received a special commendation for his brave actions, ahead of Israel's Independence Day. The US is 'simply exposing lie after lie and is standing up on truth after truth,' Netanyahu said of the passage of the Taylor Force Act. A noble mission is to educate, inspire and promote a strong connection with the people and land of Israel. 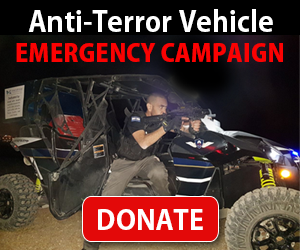 Amazing how an elite Israeli volunteer anti-terror unit uses state-of-the-art, compact, all-terrain ATVs to pursue and capture terrorists before they attack. Nevada is on its way to becoming the 20th state to pass an anti-BDS law, marking the latest victory in the fight against boycotting Israel on the US state level. Using the term "occupied" for the Western Wall and denying Jewish historical ties to Judea and Samaria is an attempt to harm and attack the Jewish state, Florida Congressman Ron DeSantis declared. Netanyahu thanked the US House of Representatives for voting 'resoundingly' in support of Israel and against the recent anti-Israel UN resolution. The outcome of the upcoming American presidential election does not matter to Israel, Netanyahu said. The BDS movement is facing new opponents almost every day.